The Big Picture The Big Picture | Barron's Magazine Cover . 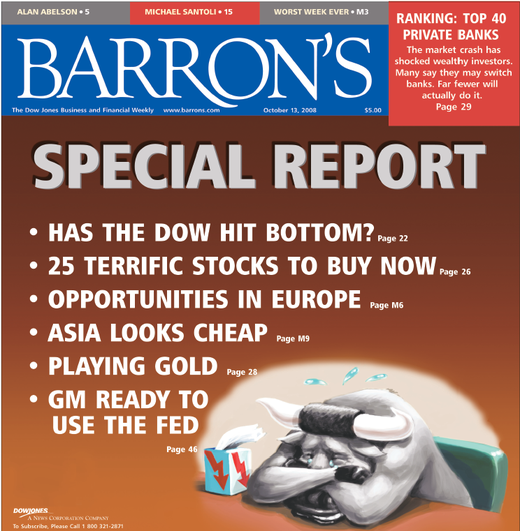 . .
Barron's Magazine Cover . . .
That hit my inbox Saturday morning. Today, the Dow had its biggest single point gain ever: Dow Surges Nearly 1000 Points. The Washingtonpost.com has launched a video series, “Hard Times,” by Emmy Award-winning producer Travis Fox, that helps to translate how the financial crisis and market turmoil are affecting individuals across the country. The series is a reflection of the economic issues that will be a top priority for citizens voting in the presidential election. Over the next couple of weeks, Fox will travel from California to D.C. talking with people in areas hardest-hit by home foreclosures, loss of retirement funds, unemployment, the rising price of food and gas and other economic challenges. "Hard Times is meant to be a hard-hitting, poignant series focusing on the pain, suffering and dashed hopes of people brought about by failed economic policies on Wall Street -- and how this all may affect the outcome of an historic presidential contest," said Eric Pianin, Politics Editor at washingtonpost.com.